For those of you that think the days of the "barn find" are over, guess what? 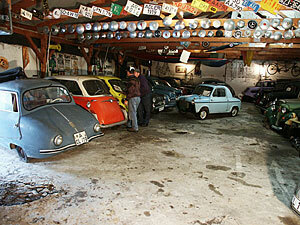 The Automuseum Warstein-Belecke Germany was opened in 1976 by a Mr. Berger who died 3 years after opening. His widow closed it up and it has sat there ever since. In October/November of 2004, Bruce tracked down this collection in Germany and found that it was For Sale, but a few people were interested in This car or That car. Bruce was interested in ALL of them! 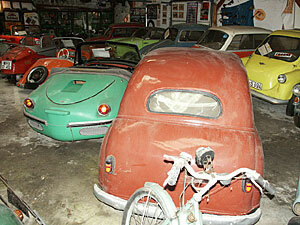 A deal was hammered out and 21 of the Microcars were packed into 7 containers and shipped to Madison, Georgia. 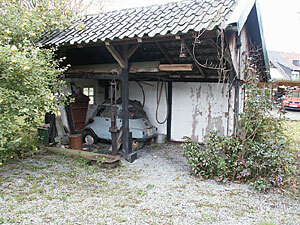 All the Microcars were still covered with the original German dust and dirt from sitting for 25 years indoors. Some cars needed nothing more than a good bath, some new tires and a bit of TLC to make it onto the Display Floor for the 2005 Micros In Madison Meet. Some are in Storage awaiting future Restoration. Others were pretty ratty, "rode hard and put away wet" would be more appropriate. No wonder Mr. Berger was able to obtain many of them for the price of a flower!